My best custom engineering contract back in the late ’70s was with Corhart Refractories (part of Corning Glass), and involved designing and building rugged industrial terminals for the factory floor. I wrote of the design in my engineering textbook, and it was even profitable. One huge regret, though… after I shipped the first three, along with a multiplexer to link them to the company’s PDP-11, they ordered about fifteen more. I was just on the verge of moving to Ohio for a job that I ended up quitting, so instead of building the machines (which would have paid off my house), I just handed the whole project to a friend of mine and moved. Silly kid! I was just 27, and had the business acumen to fit. Anyway, this was a dry press release in a local industry rag, and the photos above show the equipment in use at the Corhart foundary. I used the Intel SBC 80/04 single-board computers, wrote the assembler code on my Cromemco (S-100 bus) system, and developed an EPROM emulator to speed the edit-compile-debug cycle. Microprocessor-based terminals, ruggedized to fit harsh industrial environments, are the basis of this new factory data collection system. The IDAC/15 provides communication capability be- tween any computer system and plant personnel, capability which can be used for production reporting, QC, tracking of manufacturing variance, access control, and inventory accounting. Tested successfully in the heat, dirt, vibration, and operator roughness of a large foundry, the IDAC/15 system has been designed with simplicity of use and indestructibility as primary considerations. Plug-compatibility between terminals allows replacement by unskilled personnel, and no unusual power or environmental requirements are imposed by the equipment. The terminals (right photo) are hard-wired to the multiplexer (left photo), which is another microprocessor-controlled unit designed to handle communications between the host computer system and the units in the plant. The presence of the processors serves not only to allow high performance of the system as a whole, but also greatly simplifies the communication software burden on the programmer. All data transfers are in the form of ASCII strings over standard optically-isolated current loops, with the hardware interconnection no more complex than that of a CRT terminal. The use of a dedicated communication line (twisted pair) for each terminal eliminates a problem inherent in many competing systems which share a single loop — that of complete system failure in the event of trouble with one terminal or interruption of the line at any point. Each OSHA-approved IDAC/15 terminal consists of two 32-character text displays, a 22-column badge reader, and two arrays of lighted push buttons, all housed in a NEMA 4 oil-tight padlocked enclosure containing the microprocessor and support hardware. This configuration of input and output devices has been proven to support an extremely wide variety of interactive operations involving plant personnel and the company computer system. Unskilled personnel can be stepped through a reporting task, with validity checks performed on the spot. Because of the real-time nature of the system, most opportunities for error are eliminated. The terminals are directly interchangeable on the plant floor, requiring only the attachment of power and communication for installation. Internal self-test programs allow thorough troubleshooting on-site. The ruggedness and versatility of the terminal design have been demonstrated to be sufficient to allow installation on a fork-lift truck, interconnected with the rest of the system via a 432 MHz UHF radio link. The material handling advantages of such a mobile computer peripheral are considerable. 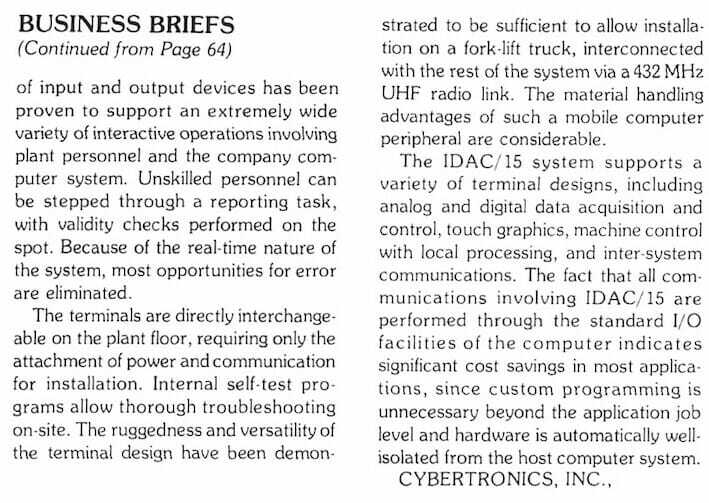 The IDAC/15 system supports a variety of terminal designs, including analog and digital data acquisition and control, touch graphics, machine control with local processing, and inter-system communications. The fact that all communications involving IDAC/15 are performed through the standard I/O facilities of the computer indicates significant cost savings in most applications, since custom programming is unnecessary beyond the application job level and hardware is automatically well-isolated from the host computer system.